Fight on the Flag » Blog Archive » Keep doors and Perle’s first PVP video! Keep doors and Perle’s first PVP video! Yesterday’s PVP wasn’t too bad. Granted, the doors in our path are so high-level that it literally takes us an hour to get through two of them. It’s getting to be ridiculous. Realm vs. Door is an entirely new kind of fight. It’s filled with long stretches of boredom and periodic killing. Anyway, here’s a video of some of the PVP action. 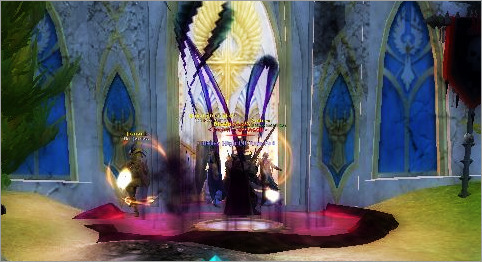 This was from a short fight (about 3-4 minutes) at Chillwind Manor after we got tired of trying to bash the doors down. I should mention there were just seven members in the group (you can see from the video in my Squared interface). I am guessing there were at least three groups of Destro in Chillwind (someone had a mod that said about 22 Destro were at the BO). I apologize for the spliced video clips in there (there are three). I only have the trial version of Fraps, which only allows 30-second clips. We actually almost wiped at one point, but because me lying on the ground staring at a wall is boring I did not include that clip. Feeback on my video capturing is welcome. My feedback to the Destro: Don’t go AFK at a Battlefield Objective! This entry was posted on Sunday, May 17th, 2009 at 5:20 am	and is filed under keep siege, Objective, RVD, RVR, video. You can follow any responses to this entry through the RSS 2.0 feed. Both comments and pings are currently closed. « Warcamper title, fun fights and more!